Title [Patrolman Brian McDonnell with Linda Durand at Park Police Station] [graphic]. Location Folder: S.F. Policemen-McDonnell, Brian. Notes Newscopy on back: "This may be an old story to you, but to 2-year-old Linda Durand being lost in the city and being rescued by a friendly policeman is a brand new experience. 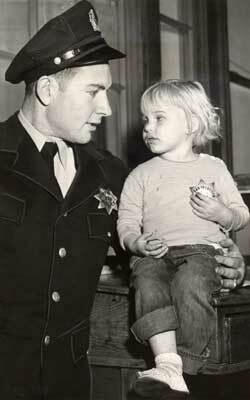 Here she tries on a policeman's star, under Patrolman Brian McDonnell's approving gaze, at Park Station, just before her mother arrived this afternoon to take her home to 1737 Clayton-st. Linda was found earlier, wandering around at Haight and Clayton-sts." Police -- California -- San Francisco. San Francisco (Calif.). Police Department.